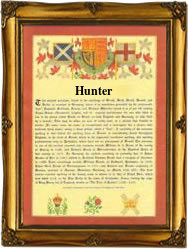 Recorded as Huntar, Hunter, and the female Huntress and Huntriss, this ancient surname is of Anglo-Scottish origins. The derivation is from the Olde English pre 7th Century word "hunta", from "huntian", meaning to hunt, with the agent suffix "-er", meaning one who does or works with. The term was used not only of hunters on horseback of game such as stags and wild boars, a pursuit in Middle Ages restricted to the ranks of the nobility, but also as a nickname for both bird catchers and poachers. The surname is first recorded in Scotland in the early 12th century (see below), whilst the first English recording may be that of Simon Huntere in the Curia Regis Rolls for the county of Bedfordshire in the year 1220, whilst half a century later we have the recording of Agnes Huntris also recorded in the Latin form of Venatrix, in the Hundred Rolls of (appropriately) the former county of Huntingdon in 1273 . A Scottish family called Hunter gave their name to the port of Hunterston in the former county of Ayrshire, now part of Strathclyde region, an estate being granted to Norman Huntar in 1271. Later examples of surname recordings taken from surviving church registers in the diocese of Greater London include the christening of Awdrey, the daughter of John Hunter, on October 1st 1540, at St. Leonard's Eastcheap; and the marriage of Allen Hunter and Helen Bolton on June 26th 1558 at St. Lawrence Jewry, Milk Street. One of the earliest settlers in the New World was Francis Hunter, aged nineteen, who sailed from the port of London aboard the ship "Thomas and John" bound for Virginia, in June 1635. The first recorded spelling of the family name is shown to be that of William Huntar. This was dated 1116, in the registers of Scotland known as the Inquisition of Earl David. This was during the reign of King Alexander 1st of Scotland, 1107 - 1124.